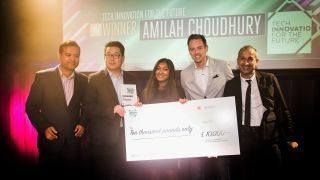 Put your hands together, it's time to celebrate the winner of our Tech Innovation for the Future competition, Amilah Choudhury from London, who walked away with the £10,000 prize. Back in July we partnered with T3 and Honor to launch the tech innovation competition, challenging students and recent graduates to come up with a brilliant tech idea. We were searching for new ideas for apps, software services and hardware with the potential to solve real problems and improve people's lives. The response was fantastic, flooding in from around the country. It made things difficult for our judging panel – made up of journalists from TechRadar and T3 – and led to some rather lively discussions as the panel finally settled on our winner. Amilah was crowned the winner during the T3 Awards, held at the Ministry of Sound on September 27, alongside two runners-up. Amilah came up with an idea for an app that helps people discover new things to do in their local area. "Some of the best and most rewarding experiences in life come from spontaneity – from discovering, exploring, and revelling in the ambiguity of the unexpected and unknown which this app will help to the consumer to achieve," Amilah wrote in her entry. The app, called Seek, takes inputs such as your location, how much time you have, and which methods of transport you can use and then create itineraries of experiences just for you. "The output will be a randomly generated itinerary which will have your location as the starting point and will plot a route leading you to randomly selected places and events – be they parks, attractions, special events, cafes/restaurants and more," explains Amilah. "Using this app will enrich the consumer and create the opportunity to try new things, potentially explore lesser known places and have interesting stories to tell. Tourists could use this app if they have limited time and have no idea what to do." The judging panel loved this idea, for reasons Amilah summed up brilliantly: "People can be so suffocated by choice that the result is indecision. Having this app pick something for you and your friends to do will be amazing fun, create great stories and provide a sense of achievement." In second place was Andrew Garbett with his system ThinkActive.io. This uses inexpensive activity trackers and pseudonymous avatars to help 8 to 11 year olds keep fit while learning about data privacy at the same time. "The technology has been designed specifically for group activity tracking for primary school children and focuses on pseudonymity as an approach to managing privacy of personal data and promotes social interactions between children to enhance data literacy and collective understanding of activity tracking data," explains Andrew. "Our ultimate goal is to reduce national obesity levels in primary school children and provide them with the tools and skills necessary to understand their increasingly data-driven life and prepare them for an active and healthy life into adulthood." ThinkActive.io has had two successful run-outs with the Newcastle United Foundation and the team recently deployed the technology in a local high school. Andrew says the next steps are to rapidly expand on three dimensions: regional and national growth in Premier League Football, entrance into Premier League Rugby, and development for health and wellbeing programmes for the workplace. We wish the project the best of luck. In third place, the judges chose SOSight by Suleman Sujad. SOSight is a concept for a free emergency services app which would allow a user to easily contact the police, ambulance, fire department and other rescue services, sending photos or video footage of their location to aid with their rescue. The app would also send the user's location details to the emergency responder. What a great idea – we're just surprised that it doesn't exist already. All the best for the future! We'd like to thank Honor for its support, and of course, everyone who entered. Here's to next year's Innovation for the Future project!